In 1901, Austrian designer Koloman Moser published Die Quelle: Flächen Schmuck (The Source: Ornament for Flat Surfaces), a compilation of vivid pattern designs intended for flat surfaces. A series of plates from this book are in Cooper Hewitt’s collection, including this one, called Acricola Bodenbelag. Primarily known for founding the influential Wiener Werkstätte (the Vienna Workshops) along with the architect Josef Hoffmann in 1903, Moser’s book was one in a series of projects by the prolific designer, who designed everything from interiors to furniture. His early influence in the Viennese Secessionist movement at the close of the 19th century is evident in this design for a floor treatment. The kaleidoscopic pattern of interlocking red and gray hexagons marries simple lines and modern, geometric forms with a bold color palette. This pattern, which at times looks like a seed pod or perhaps a bat-like animal, also makes reference to the rise of Art Nouveau, a style dominant in Paris at the turn of the century that was primarily influenced by elements of the natural world. Print, Title Page, Die Quelle: Flächen Schmuck (The Source: Ornament for Flat Surfaces), plate 1, 1901. color lithograph on paper. Gift of Jerrol E. Golden. 1999-41-1-2. Andrew Gardner is a Curatorial Assistant at Cooper Hewitt, Smithsonian Design Museum. 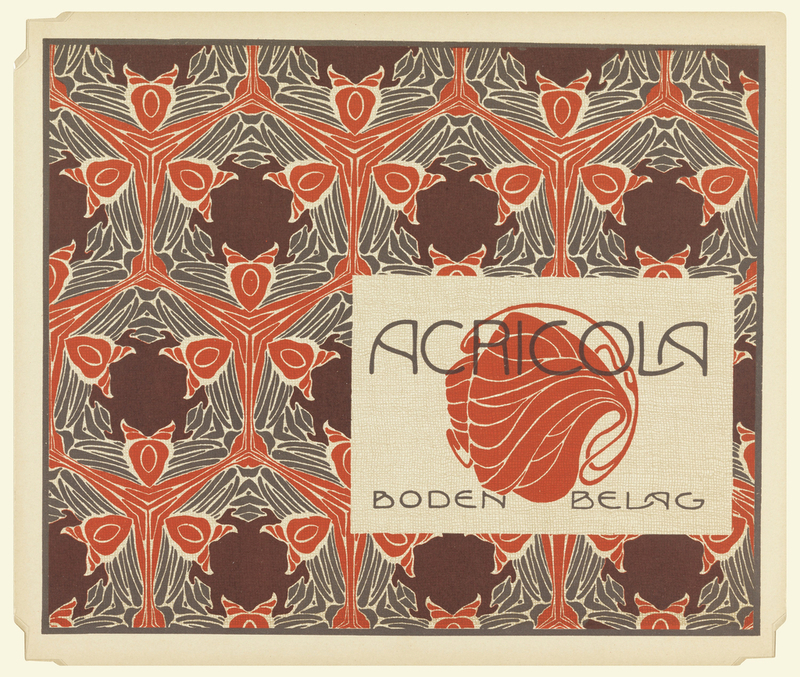 Print, Acricola Bodenbelag (Acricola Floor Covering), plate 26, in Die Quelle: Flächen Schmuck (The Source: Ornament for Flat Surfaces), 1901. color lithograph on paper. Gift of Jerrol E. Golden. 1999-41-1-27.